Tomas van Houtryve, Suspect Behavior, 2014, gelatin silver print on Baryta paper, 40 x 60''. Four months ago, the Obama administration released its first public report on drone-related civilian causalities. A total of 116 noncombatants were killed by US drone strikes over the past eight years. Empirically speaking, far more civilians, plus armed forces, die in a single year of on-the-ground combat. But the murder of those 116 people haunt us: Their deaths are a moral disgrace, and the Belgian photographer Tomas van Houtryve tells us why. Since 2013, van Houtryve has been traveling across America with his camera attached to a small drone. The places he visits—beaches, malls, gated communities—are familiar and innocent enough on the ground. But seen from the air, they appear at once dangerous and vaguely unbelievable. It’s as if the world has been reduced to data. We see unsuspecting citizens but process them as targets. We see low buildings and wonder what’s hidden inside. Our territory has turned into a map. In the eerie midair silence, you almost expect to hear bombs fall. Which is not to say that quotidian reality has totally disappeared. The day-to-day continually asserts itself but is always deformed by perverse national security drama. 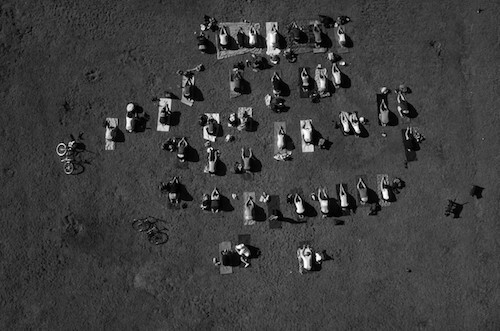 Suspect Behavior, 2014, for example, shows a group of people practicing yoga on a beach. The deadpan title works in two ways. On the one hand, it’s a straight geopolitical inflection: From a distance, the exercisers look like Muslims kneeling to pray. On the other hand, van Houtryve makes a more general point: For the drone pilot, all behavior is suspect behavior. This is the metaphysical violence that drone warfare conducts on humanity, and this is why it transcends empiricism. Van Houtryve has held up a dark mirror to the American government—it should take a long, hard look.